After decades of pushing, my father wanted to ride. He bought a Snapper mower, and I remember running after him while he drove. I liked how the grass would lighten or darken depending on his direction. His stripes and patterns were forms of revision, our home made new. My father cared about our lawn, but never became obsessed with it. Like his father, he was a carpenter, so he thought in geometric precision. He always had a pencil sharpened like a blade that he would use to tick-off inches or locations to saw. He would lay awake in bed planning the leveling of a cabinet top or the raising of a floor. Despite that attention and forethought, my father’s pride in his lawn never made him prideful. One’s lawn is like a face for the world. Siding and roofs need to be replaced in time, but an unkempt lawn soon spills into the driveway, over curbs, onto the road. For my father, a former All-American running back who was calm and soft-spoken, caring for a lawn was like an exercise in restraint. A way to control one’s own space. The weekly ritual of mowing, of men and women walking their property like mechanical monks, is fodder for literature. Robert Wrigley’s gorgeous “Mowing” is one of my favorites. How true are these opening lines: “Sleepy and suburban at dusk, / I learn again the yard’s / geometry…Shoving such a machine / around a fairway of dandelions, / it is easy to feel absurd.” During one cut, his mower’s blade “pulls” yellowjackets “from their deep sweet chamber,” and he is stung. The man torches the nest, and the “blackened” lawn scar remains until it is covered by snow, only to be revealed again come spring. Mowing is a cycle of returns. For years I offered to mow my father’s lawn, but was careful to not steal that ritual from him. He would have given it to me, but part of growing up is knowing what is yours, and what is not. I worked for town and county grounds departments during the summers, mowing roadside slopes and rocky park entrances. I later worked for The Seeing Eye, where I graduated from push mowers to a wide Steiner tractor, the type used on baseball fields. I would bring a Gatorade and a book — everything from The Imitation of Christ by Thomas à Kempis to Dog Soldiers by Robert Stone — to a wide expanse at the edge of the campus. Bordered on one side by a treeline, and the other side by a post-and-rail fence, I mowed for much of the afternoon, taking breaks in the shade to read. The Steiner worked well, but had to be trucked to Pennsylvania whenever it needed service. After I got married, I wore my father’s Snapper into the ground, but my wife surprised me with a John Deere. We moved to a new house with several acres, but I committed the mortal small engine sin — not checking the oil — and the tractor choked to a stop on a hill. A month later, grey clouds swarming above and Hurricane Sandy hours from landfall, I sold the tractor to a man named Norbert. He pushed the mower into a white van, and drove into the coming storm. Some days I can move the mower slowly, along lazy paths. On my return from each lap, I see my daughters leaning against a window, laughing at daddy spinning around on a ridiculous machine. On other days, when rain beckons and the grass looks nearly knee-high, I need to scorch green earth. More often, I simply head out to the lawn with the same source of pride that I bring to words. I want the lawn to look nice because it is ours. We have worked years for it. Pride is difficult to parse in the present moment. Pride is not the same as vanity. Pride is what makes a young writer believe that her words are worth reading, despite a world, a culture, that might prefer her silence. Pride is the most important trait that I can help shape in my students; pride means worth. In our collective fear of being too proud, I wonder if we have enabled some to not care as their default emotion. We could do worse than to create things that we are proud of, whether they are loving relationships, careful words, or mowed lawns. It is natural to hope, even if that hope is somewhat against the weight of experience, that artists can light the path ahead. This reminds me of a couple of essays I have sitting in a drawer: “Short Story Solder: On Leaky Pipes, Elbow Grease, and Fiction” and “Clothesline of Despair: How Doing the Laundry Saved My Writing”. I’m still working on “All The Pretty Cans All In A Row: On Food Labels And Literature”. Max, let me know if you’re interested. …Only in America. The rest of the world finds it tedious. She hated a mown lawn. Maybe that was because mow was the reverse of wom, the beginning of the name of what she was—a woman. A mown lawn had a sad sound to it, like a long moan. From her, a mown lawn made a long moan. Lawn had some of the letters of man, though the reverse of man would be Nam, a bad war. A raw war. Lawn also contained the letters of law. In fact, lawn was a contraction of lawman. Certainly a lawman could and did mow a lawn. Law and order could be seen as starting from lawn order, valued by so many Americans. 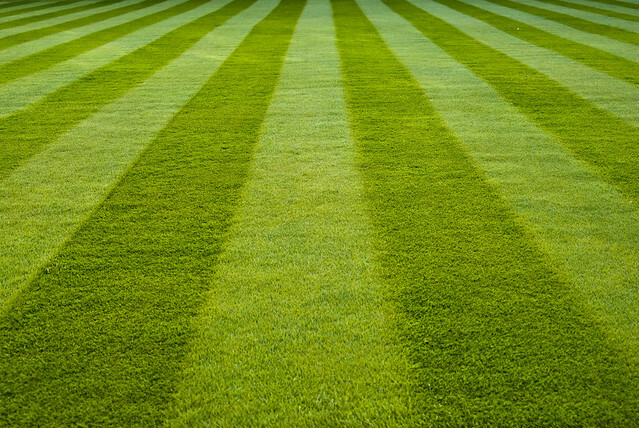 More lawn could be made using a lawn mower. A lawn mower did make more lawn. More lawn was a contraction of more lawmen. Did more lawn in America make more lawmen in America? Did more lawn make more Nam? More mown lawn made more long moan, from her. Or a lawn mourn. So often, she said, Americans wanted more mown lawn. All of America might be one long mown lawn. A lawn not mown grows long, she said: better a long lawn. Better a long lawn and a mole. Let the lawman have the mown lawn, she said. Or the moron, the lawn moron. To live in Haworth during Charlotte Brontë's time would have made anyone from the 21st century chronically nauseated.